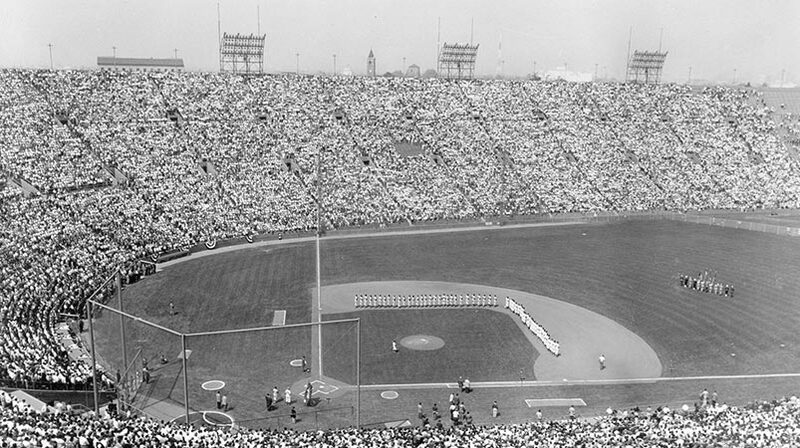 The Dodgers won back-to-back National League Pennants in 1952 and 1953, but in both seasons finished on a losing note in the World Series against the rival New York Yankees. In 1954, there was a new manager when the club arrived in Dodgertown, as O’Malley had hired solid baseball man but relatively unknown Walter Alston. The quiet but firm Alston replaced Charlie Dressen, who had failed in his demand for a three-year contract, which was against existing club policy of one-year deals. Alston had been a fixture in Vero Beach for years as a successful minor league manager. His 1953 Montreal Royals club defeated the New York Yankees’ Kansas City Triple-A team to win the “Little World Series.” Alston would go on to sign 23 consecutive one-year contracts under O’Malley and be enshrined in the National Baseball Hall of Fame. 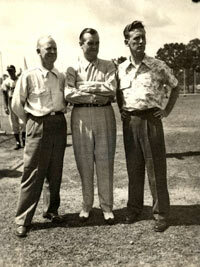 The Dodgers played four spring exhibition games and 96 total organization games at Dodgertown in 1954. It was also in 1954 that an energetic and talented broadcaster named Vin Scully took the lead role, a position he still holds today. To help defray some of the year-round expenses of maintaining Dodgertown and to reach out to youngsters, O’Malley and his staff developed a Dodgertown Camp for Boys ages 12-16 initiated in July and August of 1954. O’Malley did his homework regarding sports camps, writing to Ed Steitz at Springfield College for background materials on running a camp. Springfield was recommended to O’Malley as running a model camp program that was the best in its field. 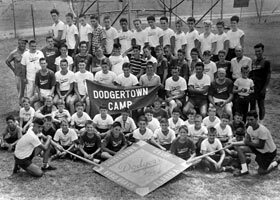 When the Dodgertown Camp for Boys began it was to be an all-sports camp, promising an opportunity to receive instruction in baseball and a variety of recreational activities, including swimming, tennis, fishing, basketball and shuffleboard, all while living on base. 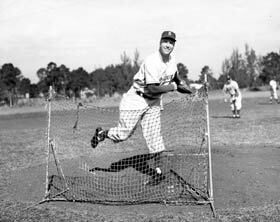 Walter Alston, who was named Dodger Manager by Walter O’Malley for the 1954 season, throws batting practice. Alston was a successful minor league manager in the Dodger system, before his promotion. Red Barber, Connie Desmond and Vin Scully comprise the Dodger broadcast team in 1950-53. Barber and Scully were inducted into the National Baseball Hall of Fame as winners of the prestigious Ford C. Frick Award. Citing year-round potential for the complex, Walter O’Malley launches the Dodgertown Camp for Boys. Campers at the initial 1954 session paid $500 for two months housing, all meals and sports instruction under the directorship of track star Les MacMitchell. Peter O’Malley was a 16-year-old camp instructor, while his sister Terry served as a secretary for the camp’s administration.